Sorry, grandma (it was her birthday), but I had a horrible day yesterday-the day from Hell. I diligently worked on plugins, our new printer and a project that I cannot discuss. Plugins are these wonderful/awful/annoying software components that help a bigger program function (like the twitter, facebook, or print option below) on my blog. I had 3 major components to make work with my theme. The previous plugins decided to stop properly functioning after almost a week of success. For some reason, this theme has problems working with many of the popular wordpress plugins. It will and one day, it just stops. I’ve tried other themes but I keep coming back to this one. One will work and mess up a few others and I’m in reverse. When this happens, I try to figure out and adjust the setting to acquire an appealing looking/functional blog. I haven’t had much luck in that area and thus, I would just leave it with the intention to adjust it later. I’m not the kind of person to just let things sit there in appearance/functionality purgatory. I had to adjust when I started the dabble. What led me to doing that was the many hours, days, and weeks of different combination of plugins that never seemed to jive with one another in the end. I gave up. Not forever. I downloaded my heart out yesterday and randomly hit the plugin jackpot because the new ones work with the old, with the theme and work in general. Fingers crossed. It only took several hours. Of course, the entire site isn’t the way I envision but I’m loving any success right now. This non-designer/technical lady is getting the hang of things. It might take me longer but I can usually figure it out; I’m not completely useless. After working on that for hours, I went on to the printer. Some of you might remember my announcement about getting a new one in June. Whoa, that was June? It does this thing when you want to print that says it has a paper jam…it doesn’t. Once you follow the directions, it’s supposed to stop dinging…it doesn’t. Since it’s doing this, it will not print. You have to resort to shutting it down, cancel your jobs and try again when it reboots. Half the time this does nothing. It also hates to reuse the backside of paper, which is often the thing that sets of the paper jam call. We bought a well-rated printer/copier/scanner/fax machine so it must be us…me. I’m just relying on the fact that we don’t print that often. That project didn’t get far. Then, the project that I won’t discuss (it’s a surprise). In the name of not-so-legal downloading, I really shouldn’t say anything. I’ll leave it like this: 3 hours, 1 song, slideshow and me screaming. Got a clearer picture? I don’t think this project will ever come together. For some icing on the crap cake, my husband needed to be picked up from work after he also had the day from Hell. (He had to create 8 programs to help the broken CNC machine at the other plant.) I was excited to get to drive again. There’s no reason for me to do so during the week but I do have the car, since Greg carpools, for emergency/errand reasons. (Whenever I say that, I think how different my life is in Minnesota. I was a driving fool in Indiana.) On my way out the door, the plan was to pick up some dinner, drive the 30 minutes there so he could perform his duties and be able to get home when he finished. My car had other plans and since I don’t have the keyless remote, I do what normally is done and used my key. Bad idea. This set the alarm off and wouldn’t let me start the car. Not the first time. Ru2 has a mind of its own every few months and doesn’t like keys even though we’ve done the “hokey-pokey” (putting our right arm on the radio, the other on the unlock button, our right foot on the ignition and tapping all of these things 5 times for the alarm to stop…it feels like that) routine to stop it and adjust when the alarm goes off. I tried doing what was the actual routine while the alarm went off over 5 times, in town, with many people watching. There’s no button under the dash, holding the unlock button down for a certain amount of time doesn’t help and finding the info again in the manual wasn’t an option. I said many choice words, called Greg (yelling), slammed the door shut and went back to the apartment. Greg got a ride from Derek (thank you), our friend, and Greg worked on the alarm upon arrival. Apparently, when I tried turning the key 3 times within 5 seconds (one of the routines), I didn’t do it right because that fixed the Forester’s alarm. I now have the keyless remote so I don’t have to work with this annoying event. After that, we both went to Greg’s work so he could begin those 8 programs. We got home late and it was not a fun day. Anyone for a drink? I’m abstaining right now but this drink was refreshing when I had it. 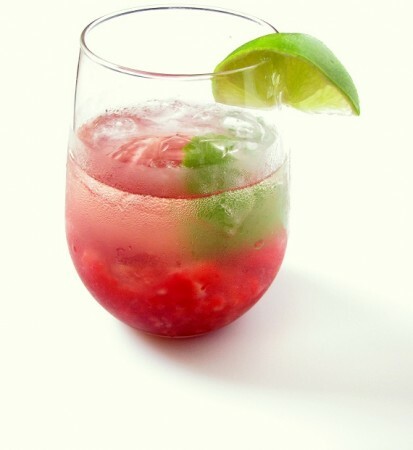 The raspberry smash, from Bon Appetit, adapted from Bella Vista Restaurant in California, is one of those beverages best sipped on a summer day, a rough one. I left out placing sugar on the rim. Simply lovely. Place 2 lime wedges, raspberries, vodka, and sugar in a cocktail shaker; with a muddler or spoon handle, smash the mixture. Add the ice and shake for 10 seconds. Divide between 2 glasses (don’t strain) and top with Champagne. Serve with lime wedge on the side.